A perfect stepping stone to those beginners who wants to experience hiking and see the scenic beauty of Negros Occidental. Let's all head up north, to San Carlos City. Me and my other 3 travel mates found ourselves in Bacolod South Bus Terminal at around 5 in the morning. From here, we will catch a bus bound for San Carlos City. The jump off point for Mayana Peak. We were on the road for about two hours, served with typical countryside scene, coconut trees, some houses by the highway and green rice paddies. Upon getting to Sitio Punod, of course, habal habal drivers came and approached us if we wanted to go to Mayana Peak. First order of the day, have breakfast. There’s a nearby restaurant (I forgot the name) few minutes walk from the habal habal terminal. Fully loaded breakfast has been served and off we go to our main destination – Mayana Peak. It was indeed a bumpy road going up since it was a slippery kind of Sunday. One reason while the 'habal habal' ride is a bit expensive. They posted 100 for dry season, then 150 during rainy season. I guess the price is reasonable enough, knowing how crazy the road was going up there. After some 20-30 minutes ride, we reached registration area. Listed our names there and after that, they provided a tour guide. There’s no entrance fee and tour guide fee so it’s all up to you how much you will give. Our guide was a teenage girl, she served as our photographer as well. The trail is easy, but for someone who hasn't been into hiking lately, it made me catch my breath. Tsk, time to lose some pounds, girl! There are three big stones at the top where you can have your photo ops. I content myself with just one, I just have to enjoy the beautiful scenery served in front of me. That short 10 – 15 minutes to the view point of Mayana Peak became a struggle for me, yeah, I know, I need to lose weight (hehehe!) But as they say, sacrifices will always be paid off. This is my reward, a stunning 360′ view of Negros Island. From any point in Negros Island, ride a bus bound for San Carlos City. Fare is between Php 100 – 150 depending on where you ride from. Estimated travel time is 1 – 2 hours. 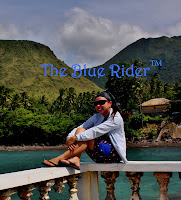 When you arrive at Sitio Punod, you are given the choice to walk all the way to the Mayana Peak or ride a motorcycle, locally known as “habal-habal” to the peak. Fare is about Php100 - 150 back and forth and would take about 15 – 20 minutes of bumpy ride.